ISO 50001 is a management system that helps you improve the energy performance in your business, and use the energy more efficiently. ISO 50001 is a management system that helps you improve the energy performance in your business, and use the energy more efficiently. Thus, the objective of this standard is to cut energy costs while improving business sustainability. 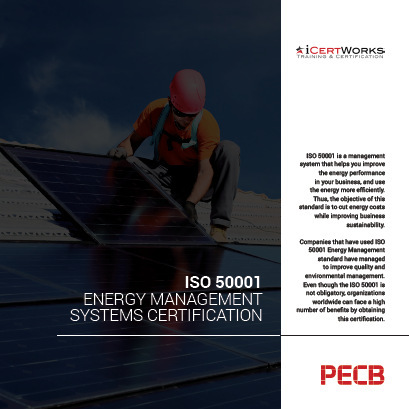 Companies that have used ISO 50001 Energy Management standard have managed to improve quality and environmental management. Even though the ISO 50001 is not obligatory, organizations worldwide can face a high number of benefits by obtaining this certification. ISO 50001 certification (also known as "registration") is a third-party audit performed by a certification body such as PECB who, upon verification that an organization is in compliance with the requirements of ISO 50001, will issue an ISO 50001 certificate. This certification is then maintained through regularly scheduled annual surveillance audits by the registrar, with re-certification of the Quality Management System performed on a triennial basis. For more information on ISO 50001 Certification, please fill out the form on the right side of the page. Contact us about ISO 50001 Certification! Looking for ISO 20000 Training?